Typically, Pla Raad Prik uses a whole fish, fried until crispy, and then covered with a sweet spicy sauce made from a few ingredients; garlic, palm sugar and chilies, fish sauce and tamarind paste. 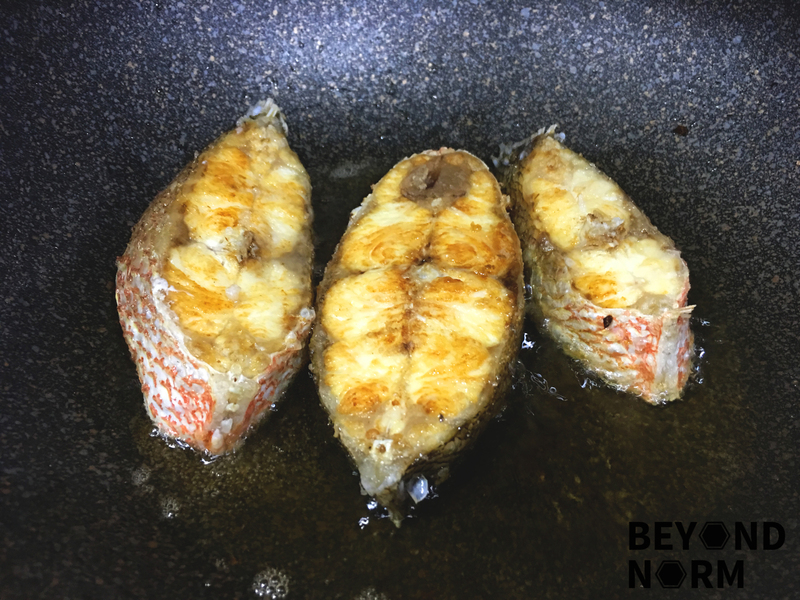 It is a very popular dish in Thailand that is often ordered for special occasions but it is really quite an easy dish to prepare at home. 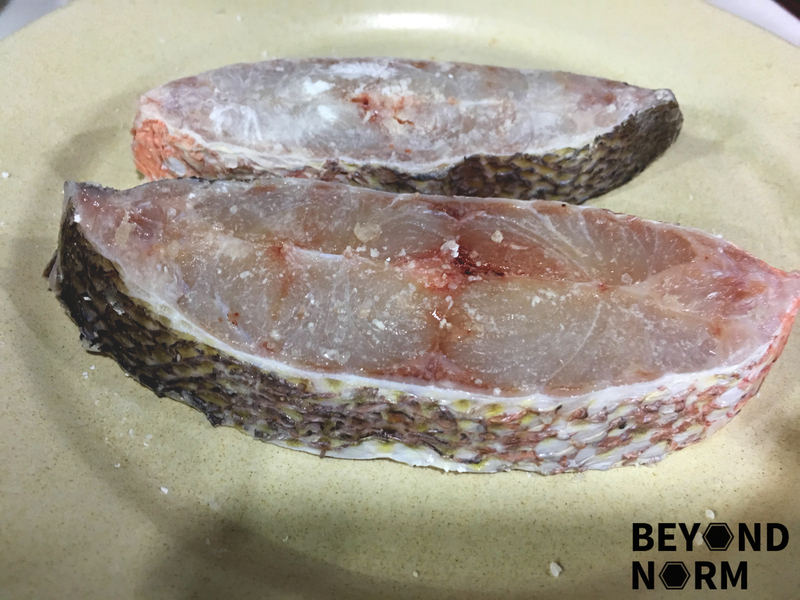 As I do not have a whole fish but only three slices of red snapper fillets in my freezer, I was contemplating whether I should cook this dish. Being a seasoned cook, I was very certain that I have all the ingredients and sure enough… Viola! A new dish was born in Mummy’s Kitchen! If you like this recipe, we hope that you could provide us with some feedback/comments via our blog. We would also like to welcome you to join our Mummy’s Kitchen Facebook Group for food lovers like you newbies or veterans. You can like us on Beyond Norm’s Facebook Page and subscribe to our blog. Follow us on Instagram and YouTube @beyondnormblog to get the latest updates and videos. Generously salt the fish and let rest for 10 minutes. Rub a thin layer of cornflour on the fish fillets and set aside. Heat up a non-stick wok/pan with 4 to 5 tablespoons of oil till it is really hot. Add in the fish and fry till it is crispy on both sides. Heat up about 2 tablespoons of oil in the same wok. Add in the garlic and the chilli and stir fry till fragrant. Next add in fish sauce, sugar and the tamarind paste. Mix well. Add a little water and let it simmer for 2 minutes or till it thickens. Pour the sauce over your fish. Garnish the fish with spring onions and chopped coriander. 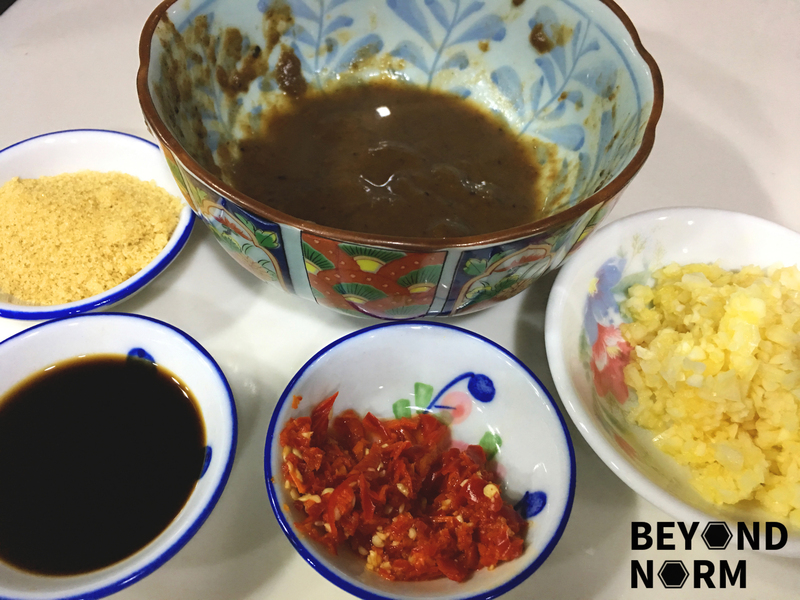 *Add more chilli if you want it spicier, add more tamarind paste if you want it sourer, add more sugar if you want it sweeter, and add more fish sauce if you want it saltier.